Working with artists, stylists and dancers to create garments and objects that evoke connection. 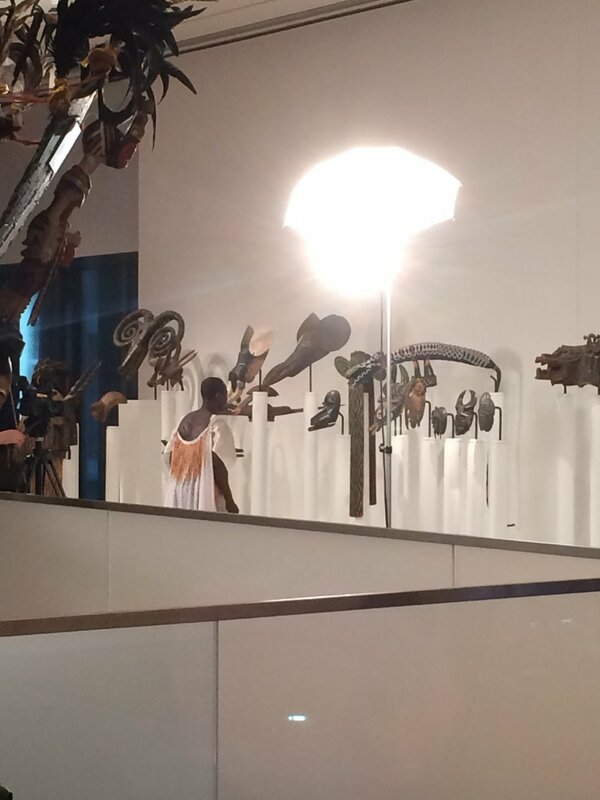 Performance of In Touch at Seattle Art Museum for Disguise: Masks and Global African Art, Summer 2015. Choreography and concept by Brendan Fernandes. Danced by Etienne Capko of Gansango Dance and costume by Anna Telcs in collaboration with Brendan Fernandes. The performance and costume were commissioned by the Seattle Art Museum. A short film presented by The Black Constellation Part twelve of thirteen of the Ode to Octavia Series presented initially during Moment Magnitude at The Frye Art Museum. Conceived, written and directed by Maikoiyo Alley-Barnes, costume by Anna Telcs, head dresses by Maikoiyo Alley-Barnes, score by Shabazz Palaces. Shot on location in the Methow Valley, Cascade Foothills and Carnation, Washington. Movement choreographed and performed by Matt Drews. Music by Garek Jon Druss and costume by Anna Telcs. The Weltgeist premiered at Velocity Dance Center in Seattle, Washington, 2015. Saint Genet (formerly Implied Violence) is a company that creates large scale, innovative environmental installations, image-based opera, body-based performance and dance. The work has been presented at The Guggenheim Museum, The Frye Art Museum, On the Boards, The Donau Festival, The Luminato Festival, and in any number of abandoned buildings, alleyways, and secret locations. 2008-2013 Costumes by Anna Telcs. Samita Sinha is a vocal artist and composer working at the intersection of music, sound, and performance. Her solo work Cipher appeared at The Kitchen, Wexner Center for the Arts, Portland Institute of Contemporary Arts, REDCAT, and Virginia Tech. Debuting for Northwest New Works at On The Boards (Seattle, 2017), I Want To Hear The Sea is a modern opera based on the life of Albert Camus' Sisyphus. Created by Rachel Green and Daniel Salo with dramaturgy, costuming and set design by Anna Telcs. "The opera 'I Want to Hear the Sea' seemed to stun the audience with its power and beauty." -Rich Smith, The Stranger. Read the full article here. I love the big picture and the fine detail, which led me to costume design and tailoring. I am a designer who has worked on numerous projects including commercial and editorial sets in Los Angeles and for Nordstrom and Totokaelo in Seattle. I have also worked as a costume designer for performance arts and dance groups and collaborate regularly with artists of varied media. In addition to my on-set experience, I have worked for high end clothing lines in NY for five years, including Thom Browne and Helmut Lang and recently spent a year leading creative projects with emerging designer in London, England while at fashion start up Not Just A Label. I have a background that gives me an unique approach to understanding direction for a style and I love nothing more than achieving a smart and cohesive look from the garments I create and tailor. I am always looking for new projects and connections. Please get in touch here.